When it comes to getting satellite Internet,you have some choices. We've compared the top two satellite Internet service providers of 2018 to let you know exactly what you are getting for your money. 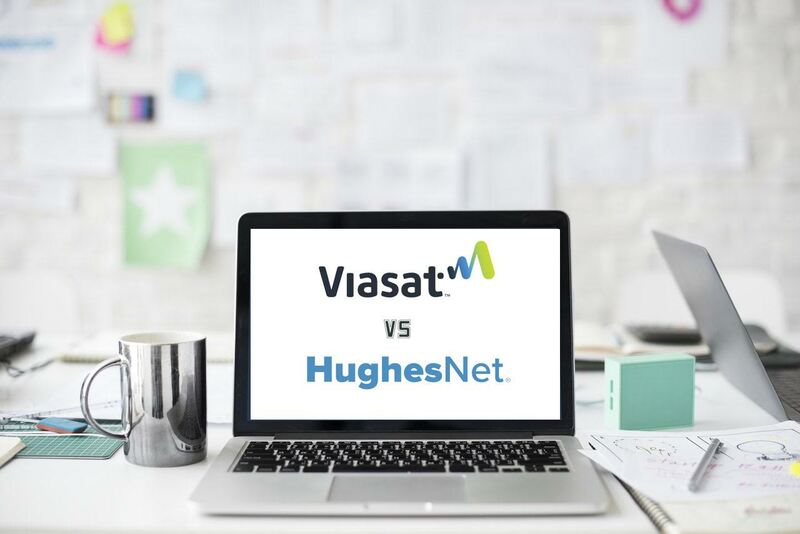 The top two satellite Internet service providers, Viasat and HughesNet, are really changing the game. Especially Viasat; they are turning it up with their improved speed capabilities! Whether you live in a rural area or just need remote Internet access, you are likely familiar with the same old speed limitations. Your wait for high-speed satellite Internet may finally be over. Check to see what offers are available in your area. Value, value, value! These guys have made some huge headway in offering packages with higher speeds and better data plans. Essentially, they have come up with an answer to satellite Internet users’ most pressing question: how can I get higher speeds? With download speeds of up to 100 Mbps, Viasat takes the cake when it comes to speed. This is essential for viewing video- or graphic-heavy websites (unless, of course, if you enjoy watching loading circle animations; if that’s the case, here’s a 10-hour YouTube loop of the spinning wheel of death). Viasat also gives you more data, which is always nice. Data limits start at 40 GB and go up to 100 GB. With more data, you decrease the risk of being throttled. You can always buy more data from Viasat for $10 per GB. Additional data plans come in the following amounts: 1, 2, 3, 4, 5, 6, 7, and 10. You can also purchase data 5 GB at a time, which may save you some money. The data plans are touted as unlimited, but there is some fine print: after exceeding the data usage threshold associated with your plan, Viasat may “prioritize” other users. This isn’t quite the same as speed throttling, but it’s similar. Apparently, prioritizing is a practice that is more lenient (depending on bandwidth available) than throttling. Upload speed is only 3 Mbps, which is nothing to write home about, but will work in a pinch. You’ll just have to wait a bit longer when posting photos on Instagram or attaching large files to emails. Another thing to note is that Viasat’s pricing goes up after the first three months. The price jump when the promotional rate ends will make even the lowest plan more expensive than HughesNet’s lowest plan. However, Viasat’s plans still offer a great deal of value for the dollars spent. HughesNet’s plans are straightforward: the higher the plan, the more data you get. Also, HughesNet offers data tokens that range from 3 GB for $9 to 25 GB for $75. There’s that data cap insurance that we see with Viasat’s additional data availability. Even if you exceed your data limit, you can still avoid throttling by purchasing tokens. HughesNet also throws in 50 GB of bonus data each month, which is nice, but it’s only usable between the hours of 2 a.m. and 8 a.m. Weird. Something you can do to take advantage of this extra data is use a program like NightShift, which lets you preload Netflix movies or TV episodes while you sleep. There is only one download speed across all plans: 25 Mbps. There are no options when it comes to speed. No matter how much you pay, you will get the same speed Internet service. Upload speed, like Viasat’s is only 3 Mbps. Although HughesNet’s plans offer different data levels, the highest data plan, at 50 GB, is only half of what Viasat offers. While they don’t stop service or charge more if you exceed the data limit, they will throttle your speeds to as low as 1 to 3 Mbps. In terms of service, both providers have something good to offer. However, Viasat has done a superior job of offering higher speeds and greater options for their customers. Viasat also offers more data than HughesNet. Their innovative packages create more value for the customer. While Viasat does up their costs after the first three months, that doesn’t detract from the value of the service, which is still offered at a good deal. It’s not that HughesNet is a bad option. They still offer decent service. They just haven’t been as innovative with their plans.